How to Create your Enchanted Heart Wisdom Altar and make magic happen today ! Altars create a focal point in which we can perform ritual, prayer, invocation, intention, meditation and more. It is an act of creativity, a collaboration with LIFE, with the God/Goddess, with the Archetypes that weave through every tradition in one way or the other. Creating Altars, for me, inspires ceremony and art and different rituals I can use to heal my heart, to express my pain or joy, to affirm my gratitude and to specifically manifest a physical expression of different intentions. For this Altar I am using the card I have created that you can receive for FREE when you sign up for my mailing list. You will get a link to download the card. If you have not signed up and want the card,you can sign up to the right. 1. Download your card and follow the instructions to print and assemble. 2.Begin this experience with a sense of wonder, an open heart, curiosity and a purpose. Come in a combination of prayer and play! You are creating something that is an extension of your soul, an invocation of your desires, a deep bow to Life and a collaboration with the energies of the Universe. 3. 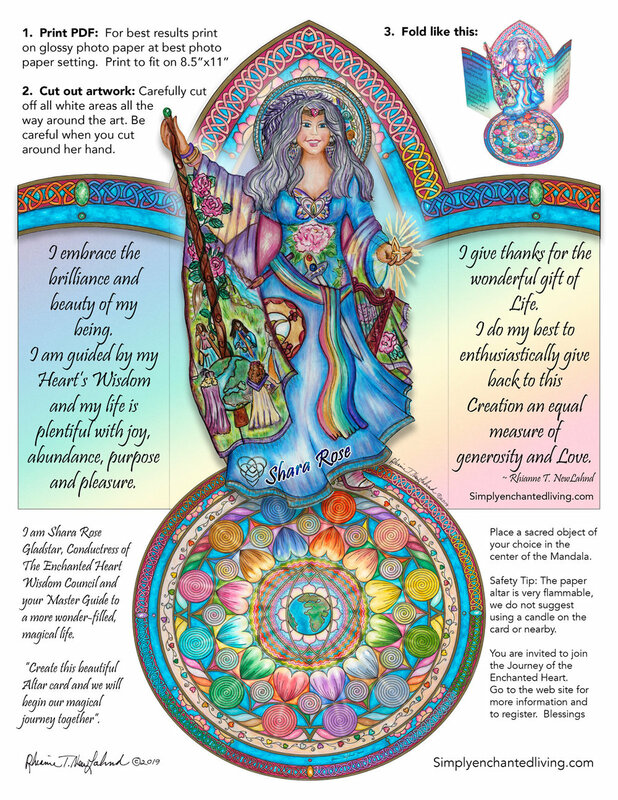 Sit quietly and ask within what you want the wise woman, Shara Rose Gladstar, who is a master teacher and conductress of Divine Energies, to assist you with. What are your desires/intentions for your Altar ? What do you want to manifest in your life? What do you want support with? I suggest that you write them down. 4. Ask to be directed to the spot in your home where this Altar can be set up. Just go with the feelings you receive. 5. Go to the spot where your Altar will be. I consider this spot to be Sacred Space, my little Temple area. If you have a particular way of clearing space, like saging, incense, singing bowls, singing, essential oil spray, then use that. I always clear the space, dust, and even clean the floor. I often clean the whole room or more when I am creating a new Altar, I feel it shows respect. While I am doing that, I begin tuning in to the creation phase, starting to focus on opening to the flow of collecting the items that will be on the Altar. Create different elevations. I use books or little boxes, to create levels for my objects. I think it looks better and more interesting. I often put down a beautiful scarf or cloth before placing the object. 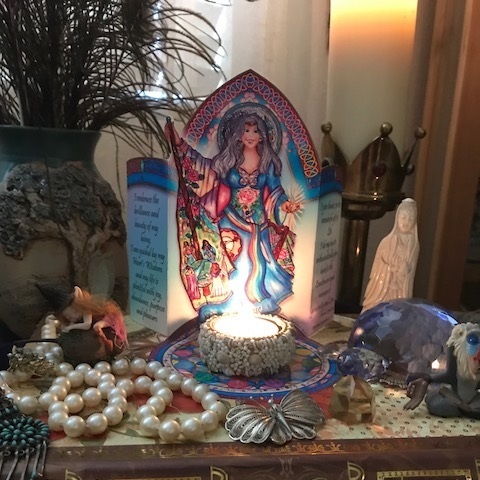 Because I am focused on the power of the work that I am doing with the Wisdom Oracle, I use the Mother’s Mandala as the centerpiece, and place the Altar card upon it. I find it to be very powerful. If you would like to order a print of the Mandala, you can do so HERE. Simplicity or complexity both work. You can use a few objects or many. I pay attention to the “story” that my altar is telling me, I look to see if there is a pattern, what the meaning is. I created this Altar to invoke new energies of creativity, success and focus for my work and business. After sitting quietly in meditation asking to be directed in creating it, I opened my heart and allowed the energy to flow. I began to collect items that felt right to me, and saw a pattern developing. Many of the items were gifts given to me by friends who always have supported me in my work. Other items represented people that I consider mentors, and still other things were about using my magic and trusting in my wisdom, the Wise Women and the Goddess. Below I have closeups of a few of the items included on the Altar. Click each to read more about what they represent.